If you love peanut butter + chocolate, you'll go crazy for these super easy gluten-free cookies! Soft, puffy peanut butter cookie + chocolate kiss = melt in your mouth YUMMY! 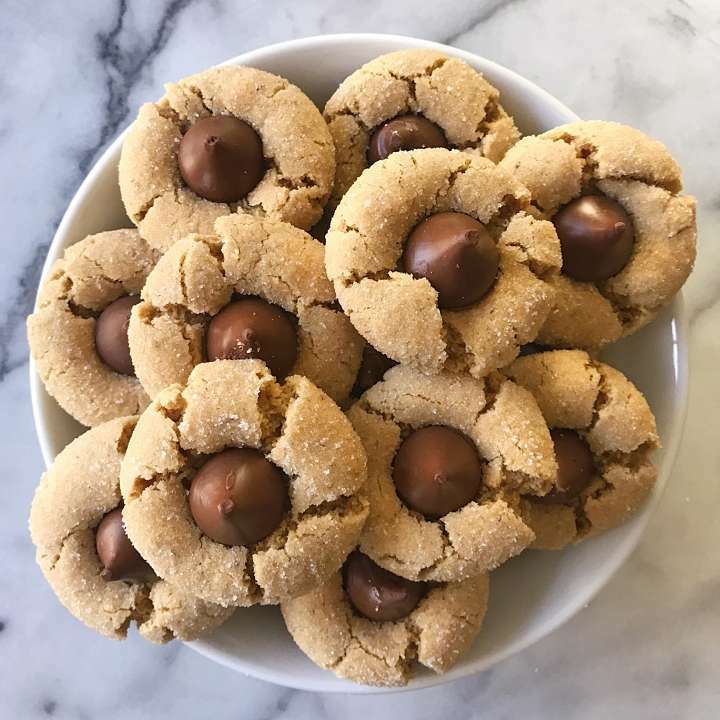 Truth: I have never made Peanut Butter Blossoms until last week when I was playing around with my mom’s peanut butter cookie recipe and added chocolate kisses on a whim…OMG, I’ve been missing out all these years! It is a soft and puffy peanut butter cookie, rolled in sugar and topped with a chocolate kiss… melt in your mouth YUMMY! If you like peanut butter and chocolate you will go crazy for these cookies! If you like peanut butter and chocolate you will go crazy for these gluten-free cookies! It is a soft and puffy peanut butter cookie, rolled in sugar and topped with a chocolate kiss... melt in your mouth YUMMY! Plus they are super quick and easy to make. Cookie can be dairy-free, egg-free and vegan. Form dough into 1 inch balls, roll cookies in sugar and place on prepared baking sheets about 1½ inches apart. Bake for 8 minutes. * Cookies will be very light brown and puffed. *if you have the time, bake one tray at a time on center rack. Remove baking sheet from oven and lightly press a chocolate kiss into center of each cookie, allowing it to crack slightly. Cool completely, then store in an airtight container. Store well at room temp for a week. Freeze well.